This article is about the men's team. For the women's team, see Poland women's national basketball team. 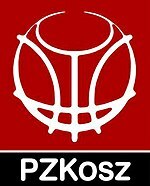 The Polish national basketball team is administered by the Polski Związek Koszykówki (Polish Basketball Association). Their biggest successes are the silver medal in the 1963 European Championships at home in Poland and fourth place at the 1936 Summer Olympics. The Poles took fourth place with an overall record of 2–3 at the second European basketball championship, the EuroBasket 1937 held by the International Basketball Federation's FIBA Europe continental federation. They took first place in their four-team preliminary group on a three-way tie-breaker after France and Latvia both matched the Polish team's 2–1 record. They then lost to eventual champions Lithuania in the semifinals and were defeated a second time by France in the bronze medal game. Bronze medal Poland won the bronze medal in their second EuroBasket competition. The competition format was a single round-robin without playoffs; Latvia and Lithuania both defeated Poland whereas the other five teams in the competition fell to the Poles. With Lithuania undefeated and Poland and Latvia tied at 5–2, the loss to Latvia was decisive in pushing Poland to third place. Due to World War II, the next European championship was EuroBasket 1946. The Poles started well, with a victory over Luxembourg. They lost their next two preliminary games to Italy and Hungary to finish in third place of the four-team group. This put them in the 7th–10th place classification semifinal, where they lost again, this time to Belgium. In the 9th/10th playoff, Poland defeated England. The European championships returned to the odd-year schedule with EuroBasket 1947. Poland placed second in their preliminary group, losing only to eventual silver medallist Czechoslovakia en route to a 2–1 record. They then went 1–2 in their semifinal group, falling to the gold medal Soviet Union team and bronze medal Egypt. This put Poland in a 5th/6th place playoff against France, who had been 1–2 in the opposite semifinal group. France won, 62–29. After an 8-year hiatus, Poland returned with EuroBasket 1955 in Budapest. They quickly showed that they could still play with the European field, winning all four of their preliminary round games to advance to the final round. Despite their mediocre 3–4 record in that round, the Poles had demonstrated that they could be effective against the best of the European pool with a 72–68 win over eventual silver medallist Czechoslovakia. They finished 5th overall of the 18 teams in the tournament. Two years later in Sofia, Poland competed at EuroBasket 1957. Despite being seeded into the same preliminary pool as the Soviet Union, the Poles went 2–1 in the round-robin and advanced to the final round. They lost their first six of seven games in that round, getting their first win in the last game of the round, against France to take 7th place overall. After a 10-year break, Poland returned with EuroBasket. It was quite sn unexpected achievement. The Poles advanced from eliminations defeated their group rivals : Ukraine, Bulgaria and Sweden. Because of injury, many key players including Michał Ignerski and Maciej Lampe did not compete. The Poles lost all 3 games, but even in defeat they remained competitive losing by 8 to a well-regarded French team and by 9 to the Italian squad. On several occasions, Poland qualified for events where they competed at the global stage. Yet, the country's major performances there date back to 1980 when the country finished 7th at the Summer Olympics. ^ a b Poland | EuroBasket 2015, FIBA.com, Retrieved 27 May 2016. Wikimedia Commons has media related to Poland national basketball team.